Among breast cancer patients who develop distant metastases, there is marked variability in the clinical course, including metastasis pattern. Here, we present a retrospective study of breast cancer patients who all developed distant metastases focusing on the association between breast cancer subtype and clinical course, including organ-specific metastasis. Tissue microarrays (TMAs) were assembled and stained for ER, PR, HER2, EGFR, CK5/6, CK14, E-Cadherin, TP53 and Ki67 for 263 breast cancer patients with metastatic disease. Tumours were classified into ER+/HER2−/Ki67high, ER+/HER2−/Ki67low, ER+/HER2+, ER−/HER2+ and ER−/HER2− groups. Relevant data related to metastasis pattern, metastasis timeline, systemic treatment and survival were retrieved. Associations between site-specific relapse and patient/tumour characteristics were assessed with multivariate models using logistic regression. Median time for development of distant metastasis was 30 months (range 0–15.3 years); 75.8 % of the distance metastases developed in the first 5 years after treatment of the primary tumour. Patients with ER−/HER2− tumours had a median overall survival of 27 months; those with HER2+ tumours of 52 months; those with ER+/HER2−/Ki67high of 76 months and those with ER+/HER2−/Ki67low of 79 months. Bone was the most common site for distant metastasis (70.6 %) followed by liver (54.5 %) and lung (31.4 %), respectively. Visceral metastasis was found in 76.8 % of the patients. Patients with ER−/HER2− tumours developed visceral metastases in 81 % and bone metastases in 55.2 %; those with HER2+ tumours developed visceral metastases in 77.4 % and bone metastases in 69.8 %; those with ER+/HER2−/Ki67high developed visceral metastases in 75.7 % and bone metastases in 87.8 % and those with ER+/HER2−/Ki67low developed visceral metastases in 76.9 % and bone metastases in 73.1 %. In metastatic breast cancer patients, tumour subtypes are associated with survival and pattern of distant metastases. These associations are of help in choices for surveillance and therapy in individual patients. Although the cure rate of breast cancer is increasing in the western world, breast cancer remains the leading cause of female cancer deaths . Most breast cancer deaths are related to distant organ metastasis, which is considered to be essentially incurable. The development of metastatic breast cancer is a complex multi-step process manifesting with distinct patterns of distal organ involvement [2, 3, 4, 5, 6]. Using gene expression profiling studies, several molecular mechanisms associated with organ-specific metastasis patterns have been reported [4, 7, 8, 9, 10, 11, 12, 13, 14, 15]. Even though these gene expression signatures have already provided useful information in the characterization of novel molecular mediators of organ-specific metastasis, translation of these recently published data to clinical practice has not been accomplished. Moreover, the number of studies focusing on association of more conventional clinicopathologic findings to metastasis pattern is limited [3, 7, 16, 17]. The metastasis pattern of breast cancer varies by hormone receptor status. It has been shown that triple-negative tumours show increased incidence of visceral and cerebral distant metastasis, while hormone receptor-positive tumours have been shown to have a greater tendency to develop bone metastasis. HER2-positive tumours have been reported to metastasize to the brain more frequently than HER2-negative tumours [12, 16, 18, 19, 20, 21, 22, 23, 24, 25, 26, 27]. Population-based studies suggest that the survival for metastatic breast cancer patients has been prolonged in recent years as a result of more effective systemic treatment [28, 29, 30]. However, patients with triple-negative breast cancer continue to have dismal outcome after the development of distant metastases [19, 22, 31, 32, 33] with a shorter median survival compared to hormone receptor and/or HER2-positive breast cancer . To improve our understanding of the time course and pattern of distant metastases, a retrospective study was carried out using tissue microarrays of primary invasive breast carcinomas of patients who developed distant metastatic disease. Our objectives were to compare the clinicopathologic findings with metastatic behaviour of the breast tumours in terms of organ-specific metastasis and associated patient outcomes. 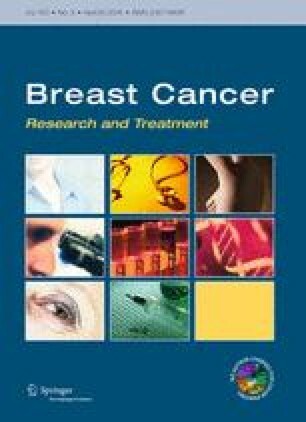 Patients with metastatic breast cancer diagnosed between 1983 and 2009 were identified from the archives of the Academic Medical Center and the Netherlands Cancer Institute (total n = 263), and relevant clinical information was abstracted from their clinical charts. This study material was strictly handled after coding of the data according to national ethical guidelines of ‘Code for Proper Secondary Use of Human Tissue’ developed by Federation of Medical Societies (FMWV) in the Netherlands . Therefore, the need for obtaining informed consent was waived by the Medical Ethical Committee of the Academic Medical Center. Metastatic disease was defined as recurrence of breast cancer occurring beyond the confines of the ipsilateral breast, chest wall and regional lymph nodes. Metastatic site was classified as bone, lung, liver, pleura/peritoneum, brain, distant lymph nodes and other (including skin, spleen, ovary, eye and other organs). These individual metastasis sites were further used to separate patients in subgroups; for each metastatic site, it was assessed whether patients developed metastases during follow-up (ever versus never for each organ site); when patients developed metastases to any organ site, it was recorded whether this was the first metastasis or a metastasis arising after metastases to other organ site arose (first/not first); and it was recorded when a patient developed metastases to one organ site only (only/not only). The presence of multiple metastases was also carefully recorded at the time of diagnosis of the first metastases as well as after the complete follow-up. In instances where patients developed another distal organ involvement within less than 2 months after initial diagnosis of a metastasis, this was also considered as multiple organ metastases at first presentation. Time from surgery to development of first metastasis, time from first metastasis to last event (metastasis-specific survival, MSS) and overall survival (OS) time for each patient were calculated. Last event date was recorded as most recent follow-up date for the patients who were alive and time of death for the others. Nineteen of the patients were lost to follow-up. Furthermore, data on systemic treatment (chemotherapy, hormonal therapy, HER2-targeted therapy) used to treat primary and metastatic disease were collected for a subset of the patients (n = 149 and 124, respectively). From all tumours, hematoxylin-eosin-stained slides from paraffin-embedded tissues were evaluated and tumour type, histologic grade according to Elston and Ellis  and the presence of lymfangioinvasion were assessed. Tissue microarrays (TMAs) were constructed by a manual tissue arrayer (Beecher Instruments, Silver Spring, MD, USA) from the selected representative blocks (n = 263). Immunohistochemical staining for oestrogen receptor (ER) [clone SP1, Ventana], progesterone receptor (PR) [clone 1E2, Ventana], human epidermal growth factor receptor 2 (HER2) [clone SP3, Thermo Scientific], epidermal growth factor receptor (EGFR) [clone H11, Dako], Cytokeratin-5/6 (CK5/6) [clone D5/16 B4, Dako], Cytokeratin-14 (CK14) [clone LL002, Leica] E-Cadherin [clone HECD-1, Invitrogen], TP53 [clone DO-7 +BP53-12, Thermo Scientific] and Ki67 [clone SP6, Thermo Scientific] was performed using an automated slide preparation system (Benchmark XT, Ventana Medical Systems, Tucson Arizona, USA). On the same platform a silver in situ hybridisation (SISH) was performed with INFORM HER2 DNA probe obtained from Ventana Medical Systems. The signal detection for IHC was performed with a biotin-free ultraview universal DAB detection Kit (Ventana Medical Systems) and for SISH with an ultraview SISH detection kit (Ventana Medical Systems). The immunohistochemistry results were scored independently by two pathologists (C.D.S-H and MJvdV). ER and PR positivity were defined as nuclear staining in 10 % or more of tumour cells. Scoring for HER2 immunohistochemistry and in situ hybridization was performed according to ASCO guidelines . Briefly, HER2 staining was scored as 0, 1+, 2+ or 3+; a score of 3+ was considered to be HER2 positive and 0 or 1+ HER2 negative and 2+ scores were evaluated by silver enhanced in situ hybridization (SISH) to determine final HER2 status. For mono colour SISH, the number of nuclear spots was counted in 30 adjacent tumour cells and tumours with an average number of HER2 signals ≥6 were considered as HER2 amplified; all other tumours were considered as HER2 non-amplified. Tumours were further grouped by ER/HER2 expression pattern as ER-positive/HER2-positive, ER-positive/HER2-negative, ER-negative/HER2-positive and ER-negative/HER2-negative tumours. ER-positive/HER2-negative tumours were further divided into two subgroups according to their Ki67 immunopositivity. For Ki-67 staining, the percentage of positively staining tumour cells was counted and a cut-off for low versus high of 13 % was used according to the St Gallen consensus guidelines [37, 38]. Hormone receptor-negative group was also divided into 2 subgroups according to their so-called basal cell marker status. The hormone-negative tumours, which were positive for CK5/6 and/or CK14 and/or EGFR and/or C-kit, were considered to be basal-like tumours, whereas the others considered to be non-basal-like group of tumours [39, 40]. Samples were considered to be positive for TP53 if more than 50 % of tumour cells showed positive staining in the nuclei. E-cadherin was scored as positive when there was any membranous staining. CK5/6, CK14, C-kit, E-cadherin and EGFR were scored as positive if ≥10 % of the tumour cells showed staining. Association between immunophenotypic findings and metastatic behaviour (including metastasis site and metastasis pattern) was assessed using either the Fisher Exact test (variable with two classes) or Chi-square test. To further explore this association, multivariate logistic regression analyses were applied to model the relationship between site-specific relapse and patient/tumour characteristics. All statistical tests were two sided and p < 0.05 was considered to be statistically significant. Survival analyses were estimated by the Kaplan–Meier method and were compared using the log-rank test. Analyses were performed using SPSS Statistics for Windows (Release version 21.0; IBM Corp. 2012, Armond, NY, USA). For 263 patients treated for breast cancer who all developed distant metastases during follow-up, we have collected paraffin-embedded tumour tissue of the primary tumour; assessed the histopathological features and performed immunohistochemical staining on tissue microarrays (TMA’s). Clinicopathologic data are shown in Table 1. The mean age at diagnosis was 50 years (range 27–86). Median follow-up was 57 months for all patients (range 0.5–22.4 years) and 11.6 years (range 6.2–17.3 years) for patients (n = 14) who were alive at last follow-up. The majority of the tumours (88.2 %) were classified as invasive ductal carcinoma, and 90.9 % of the tumours were grade 2 or 3 . Tumour size varied from 0.5 to 9 cm with a mean size of 3.2 cm. Out of 149 patients with available adjuvant therapy data, 85 (57 %) patients received chemotherapy, whereas 61 (40.9 %) patients received hormonal therapy. More specifically 46.5 % of patients with ER+ tumours were noted to receive hormonal therapy. Among 122 patients with available chemotherapy data for the metastatic disease, 50 patients received chemotherapy as first-line treatment after the development of metastatic disease, whereas 66 patients received hormonal therapy (40.7 and 50.7 %, respectively). Selective oestrogen receptor modulators were the most common (45.8 %) administered first-line hormonal therapy regimen, followed by aromatase inhibitors (41.7 %) and LH blockers (46.8 %). Only 14 patients received Herceptin therapy for treating metastatic disease. Results of immunohistochemical staining can be seen in Table 2. When grouped into subtypes according to ER/HER2 expression, 27.6 % were ER−/HER2−, 24.8 % were HER2 positive and 47.6 % were ER+/HER2−. Of ER+/HER2− tumours, 93.7 % were Ki67 high and 6.3 % were Ki67 low, 31.8 % were TP53 positive; 4.1 % were EGFR positive; 9.4 % were CK14 positive and 15.4 % were CK5/6 positive. 61.1 % of the ER–/HER2– tumours were positive for one of the so-called basal cell markers (CK5/6, CK14, EGFR or C-kit). Of note, within the hormone receptor-negative group, no significant difference was found between the tumours with and without basal-like markers regarding clinicopathological characteristics, metastatic behaviour and survival outcomes. Therefore, we have chosen to proceed with hormone receptor-negative group as one group. Findings of immunohistochemical staining for TP53, CK5/6, CK14, EGFR, c-kit and Ki67 in hormone receptor-negative tumours are displayed in Table 3. 10.4 % of tumours were E-cadherin negative; 54.2 % of these were classified as invasive lobular carcinomas. Median time to develop metastasis was 30 months (range 0–15.3 years) and median time from metastasis to death was 19 months and to last follow-up for patients alive was 64 months. Using the cut-off point of 5 years, 75.8 % of the tumours were recorded as early metastasizing tumours. In Table 4, the association between histologic and immunohistochemical variables and early versus late metastasis is shown. As can be seen, ER−/HER2− and ER−/HER2+ tumours metastasized earlier than other subgroups of tumours (p = 0.003). Almost 90 % of hormone-negative breast cancer patients developed distant metastases early versus 66 % of ER+/HER2−; within ER+/HER2− group, there was no significant difference between Ki67 high (66.7 %) and Ki67 low (65.4 %) tumours (p = 0.54). Figure 1 shows that overall survival and survival after the detection of distant metastasis for patients who developed visceral metastases (n = 198) are worse than for those who did not develop visceral metastases (p = 0.073 and 0.009, respectively). Figure 2 shows overall survival and survival after the detection of distant metastasis for the subgroups of patients defined by ER and HER2 status of the primary tumour. Table 5 demonstrates the differences of time to develop metastasis and survival time after development of metastatic disease in various subgroups. As can be seen, patients with ER−/HER2− tumours had a median survival of 10 months after the detection of distant metastasis, whereas ER−/HER2+ tumours had median survival of 19 months (p = 0.020). ER+/HER2− (Ki67 high as well as Ki67 low groups) and ER+/HER2+ tumours had a median survival time of 25 and 24 months, respectively (p = 0.75). Detailed information about metastatic behaviour was available for 256 patients; 11(4.3 %) patients presented with multiple metastasis simultaneously, while 205 (80.4 %) developed multiple metastases during the course of follow-up. Bone was the most common site for metastasis (70.6 %) followed by liver (54.5 %) and lung (31.4 %), respectively. Visceral (liver, lung and brain) metastases were found in 77.6 % of the patients. Twenty-five (9.8 %) of the patients developed only bone metastasis and 29 (11.4 %) of the patients developed only visceral metastasis during the course of the disease. Among these patients, median time to develop bone metastasis and visceral metastasis differed and was 40 and 23 months, respectively. Multivariate analyses further revealed that patients who developed visceral metastasis had a higher prevalence of multiple metastases during follow-up (p = < 0.001). The metastasis pattern was similar for patients who received adjuvant systemic therapy compared to patients who did not undergo adjuvant systemic treatment. Along with 81.3 % of ER+ tumours, 88 % of ER+/HER2− Ki67 high tumours noted to have bone metastasis. Contrarily, hormone-negative (ER−/HER2−) tumours were associated with visceral organ metastasis, yet composing 55 % of the tumours with only visceral metastasis. ER status of the tumour was significantly positively correlated to bone metastasis in the univariate as well as in the multivariate analyses. Several immunohistochemical markers, such as E-Cadherin and Cytokeratin 14, were found to be correlated to visceral metastasis (p = 0.013 and 0.018). E-cadherin was found to be positive in primary tumours of patients who developed visceral organ metastasis and the ones with visceral metastasis as initial site of metastasis (p = 0.028 and 0.040). TP53-positive tumours developed brain metastasis with a rate of 38 %, as opposed to 21.2 % in TP53-negative ones (p = 0.007). Breast cancer is a heterogeneous disease and this is also reflected in the clinical patterns of the development of distant metastases. There is marked variability in the time interval between treatment of the primary tumour and the occurrence of distant metastases; in the organs involved with distant metastases and in the response to systemic treatment in patients with metastatic breast cancer. The concept of organotropism compasses the non-random distinct organ involvement of different cancer types as well as within a given type of cancer, which usually implies a more subtle intrinsic heterogeneity among organotropic cancer cells . Along with the conventional metastatic model of “anatomical/mechanical” hypothesis, Paget’s “seed and soil” hypothesis  is a widely accepted model for site-specific metastasis. Stephen Paget’ s century old theory that proposed the organ-preference patterns of tumour metastasis is the product of favourable interactions between metastatic tumour cells (the “seed”) and their organ microenvironment (the “soil”) was confirmed by clinical and experimental research [4, 41, 42, 43]. Better understanding of this complex interaction between two compartments and consequently the mechanisms that lie beneath the site-specific metastasis may improve the clinical management, including developing novel therapeutic options, for metastatic disease. Despite the increasing tendency to classify breast tumours into molecular subtypes based on gene expression profiles first described by Perou et al. , immunophenotypic characteristics of the tumour also remain an important cornerstone of defining subgroups of the disease. In the current study, we investigated the presence of site-specific metastasis and concomitant characteristics of the metastatic disease in a retrospective series of 263 breast cancer patients, focusing on the immunophenotypic features of the primary tumour. Together with clinical observations, recent comprehensive molecular studies unveiled the considerable differences between ER-positive and ER-negative tumours. It has also been shown that ER status has a time-varying prognostic effect mainly pronounced in the early follow-up period [44, 45, 46, 47, 48]. ER-positive tumours are known for their tendency to relapse later with higher rate of bone recurrences than their ER-negative counterparts. In agreement with published literature, our data clearly indicate the close relation between ER-positive tumours and metastasis-specific survival and bone metastasis [18, 45, 46, 49]. In addition to confirming the well-established prognostic markers in breast cancer, this study was also able to verify that ER status is also an important factor for bone-only and bone-first metastasis. Likewise, in agreement with previously published data, ER-negative tumours showed a higher proportion of patients with visceral metastases [18, 20, 44, 45, 50]. HER2-positive tumours have been found as a risk factor for cerebral metastasis development (5, 12, 13, 19, 22, 24, 27, 29, 32, 33, 52, 55). However, in this study, HER2 positivity was not identified as a strong predictive factor for site-specific metastasis and early metastatic disease; of note, in our study, we did not find an association between HER2-positive status and brain metastasis. The fact that almost none of the patients in our study received adjuvant HER2-targeted therapy may play a role in the absence of a correlation between HER2 status and brain metastases (although we could not retrieve data on adjuvant systemic therapy for all patients, we know that HER2-targeted therapy was not yet available as adjuvant therapy during a large part of the period in which patients were treated). A recent cohort study demonstrated that hormone receptor (HR)+/HER2+ subtype was associated with the best prognosis after diagnosis of metastatic disease, with a median survival of 34.4 months even better than HR+/HER2− subgroup . This subgroup was followed by HR+/HER2−, HR−/HER2+ and hormone receptor-negative tumours. In our study, regardless of their HER2 status, hormone receptor-positive tumours had better survival after the diagnosis of distant metastasis. Similar to Lobbezoo et al., ER−/HER2+ tumours had better survival than hormone receptor-negative tumours. Improved survival rates of HER2+ tumours have already been reported [28, 29, 52]. Even though our study includes patients before the implementation of HER2-targeted therapy for metastatic disease, our results are comparable to this recent cohort study. Additionally, further subgrouping of ER+/HER2− tumours according to their Ki67 status revealed that only minority (6.3 %) of these tumours had low Ki67 status. Within this group of tumours, there was also no significance regarding metastasis pattern. This result may suggest that if once metastatic event occurs, prognostic relevance of Ki67 might be limited. Our analyses indicate the noticeable distinction between breast tumours with visceral metastasis and the ones without visceral metastasis. Additional to the remarkably shorter overall survival and metastasis-specific survival compared to the tumours without visceral metastasis, higher frequency of developing multiple metastasis during the course of disease, make this subgroup of tumours challenging and therefore worth to be recognized [49, 53]. Several immunohistochemical markers are known to be associated with hormone receptor-negative breast tumours especially the ones with basal-like features. It is also claimed that triple-negative status cannot be used as a surrogate for the basal cell phenotype [54, 55, 56]. In our study, we showed that a group of frequently registered immunohistochemistry markers such as CK 5/6, CK 14 and EGFR were related to the hormone receptor-negative subgroup (p < 0.001), while c-kit was not found to be related to this subgroup of tumours (p = 0.098). Further analyses within this group revealed no significant difference between basal-like group and non-basal-like group in relation to metastatic behaviour and survival outcomes. Based on gene expression profiling studies, Lehmann et al. showed that this aggressive type of breast cancer can be divided into seven subtypes as basal-like 1, basal-like2, immunomodulatory, mesenchymal-like, mesenchymal stem-like, luminal androgen receptor and unstable. They also showed that independent analysis of five datasets based on triple-negative tumours identified by immunohistochemical staining had similar clustering . In conjunction with this information, it is indicated that hormone receptor-negative group contains heterogeneous group of tumours with distinct phenotypes. We believe that further studies are indicated to explore the role of immunohistochemistry to portray these heterogeneous subgroups. The role of E-cadherin in metastatic potential of the tumours has already been a topic of interest. The absence of E-cadherin expression as a result of genetic alterations in the E-cadherin gene is observed in the majority of lobular carcinomas. Reduced expression of E-cadherin has been reported in breast carcinoma cases with a frequency ranging from 45 to 63 % of cases [58, 59, 60]. Several studies showed a higher metastatic potential for tumours with reduced E-cadherin expression [58, 61, 62, 63, 64, 65], whereas others were not able to prove such a relation [66, 67]. Interestingly, in the current study, we showed that immunostaining of E-cadherin was positively correlated with developing visceral metastases, also with developing visceral metastasis as first site of metastasis. It has been shown that tumours with TP53 gene mutations are associated with brain metastases. [27, 68, 69]. Recently, Lo et al. have demonstrated that mutation of TP53 is the most common genetic change identified in brain metastases from breast cancer. They identified that 87 % of CNS metastatic lesions in their study contained TP53 mutations compared to 25–34 % mutations in all breast cancers. . Consistent with the previous reports, we showed that TP53 immunopositivity is significantly associated with subsequent brain metastasis. The cohort of patients in our study was treated between 1983 and 2009; the median size of the primary tumours was 3.2 cm. It may well be that metastatic patterns will differ for patients who were treated more recently and for patients who presented with smaller tumours. It will therefore be of interest to perform a similar study to the one presented here in the future for a cohort of more recently treated patients. This study demonstrates that subtypes of breast cancer mainly defined by ER, PR and HER2 and are strongly related to the metastasis pattern, in terms of site-specific relapse, early/late metastasis and survival outcomes. Hormone receptor-positive tumours have tendency to develop bone metastasis and they have better survival outcomes compared to hormone receptor-negative tumours with a tendency of developing visceral metastasis. HER2 status was not associated with pattern of distant metastases; in agreement with previous reports, P53-positive tumours were more likely to metastasize to the brain than P53-negative tumours. In addition, we show that tumours that develop visceral metastasis have worse prognosis than the ones without visceral metastasis and immunostaining for E-cadherin and cytokeratin 14 can be of help to identify such tumours. These associations are of help in choices for surveillance and therapy in individual patients. This research was supported by the Center for Translational Molecular Medicine (BreastCARE). This study material was strictly handled after coding of the data according to national ethical guidelines of ‘Code for Proper Secondary Use of Human Tissue’ developed by Federation of Medical Societies (FMWV) in the Netherlands . Therefore, the need for obtaining informed consent was waived by the Medical Ethical Committee of the Academic Medical Center.